Check out this wild crew. Time to talk about super-powered ponies again! These guys make up the rest of the playable cast for the upcoming demo. They have more weird and extreme designs as I experiment just how far I can take the look of a pony and still call it one. My goal was to see if seaponies, dragon fillies, and bigger horses still fit in with the rest of the cast. For the most part they do, but there may be some tweaking left to do. The big one in the middle looks more overpowered than it really is, so maybe I have to tone it down a notch. What do you think of it? Get some more info on Orscina, Vinerva, and Thestra then leave a comment below. Ability: Restless | Cannot be forced to sleep. 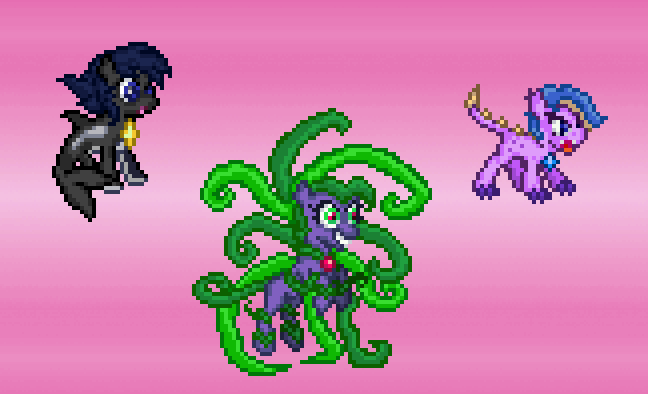 Those familiar with Friendship is Magic would get the reference right away, but she's based on a character known as The Mane-iac, a Doctor Octopus/Medusa style super villain. I was recently reading a comic featuring the Mane-iac and made a note to include some homage to her in my game. A rare Plant/Chaos class with a crazed look just sounded too perfect. This pony also gave me a chance to play with the idea of having some exceptions to the "small horse" rule. The body itself is about the size of Simber's sprite, but the vine tentacles take up screen space. As it is now, I'm being told that this would make for a cool ultra form, but Vinerva needs a smaller base form. What do you think about her look compared to the others? Ability: Swimmer | Speed is instantly maximized when in rain. The design process got messy with this one. Should her stripe be white or blue? Orscina is the aurora pony. I can imagine her sitting atop of glaciers staring at the northern lights in the night sky. She can also be related to a lighthouse, having her gem glow brightly to lead sailors to shore through thick fog. Because of this vibe, I made her an Aqua/Light class. I need to include her in the demo so people can swim around in the test overworld. 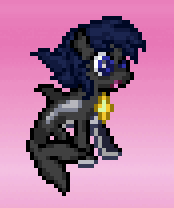 Since there are no HMs, players need to have access to a pony that swims naturally, so an Aqua class is a must! This pony's design gave me the most trouble. It was hard to decide how to pose a pony with fins in a believable way. I knew I didn't want the air-swimming found in Pokemon games for world-logic reasons. I decided to go with a Vaporeon pose where it sits up and slowly flaps its fin on the ground. This was the first new design I tried but put it aside when the tail gave me trouble. Came back two weeks later with a new tail angle and it all made sense. The colors on Orscina were bugging me for a week. I keep finding myself trying a new scheme just to see how it looks. You may even notice that her side stripe is a new white color since Tuesday's post. I changed its color after getting feedback at my school's gamedev club meeting. I knew she needed more white but didn't know where to put it. I'm still debating white vs blue even now. Turned out not to be the face. Orscina is based on the aesthetics of an orca whale, my favorite sea creature. She has a slick, white underbelly and leg sleeves. Her blue stripe was originally white but I felt that she needed more blue on her to emphasize the Aqua class and match the eyes. The hair was silver when I imagined her, but I found that darker colors looked better. When looking up seaponies ages ago I came across this image of a very nice looking seapony. It matched with my orca idea, and had tons of detail. Pixelart limits how much detail the ponies can have so I have to focus on big, noticeable features. Studying Centchi's image gave me the idea of adding extra fins to the back of the body and having the orca stripe match either her gem or her eyes. In the end, it turns out that a plain white stripe works better and carries the eyes to her tail and helps her face stand out. Ability: Cosmic Power | Gains an energy (E.ATK or E.DEF) stat boost every 3 turns. I want to keep her base form small and agile. 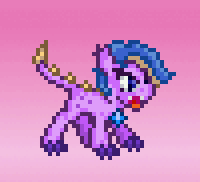 Thestra is a small and agile draconic pony with one of the highest speed stats. She's more of a class cannon who hits fast and hits hard, but can't really take retaliation. There will be multiple ways to play her with the 4 move limitation. She's a magic dragon with lots of critical hit moves and one of the only ponies able to use the healing move Recover (to make up for very low HP and defenses). Spike X Rarity fan character Lavender. 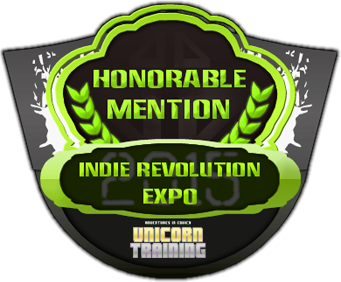 So these are the ponies making up the only available party pool in the BYOC demo coming up in a couple weeks. I'm really liking the feel of the characters so far and it's nice to have a basis for designing the rest. What do you think of them? See any room for improvement? Have any pony idea's you'd like to see in the final game? Let me know down below.